LRO has been collecting high resolution images of Constellation Program Regions of Interest (RoI). 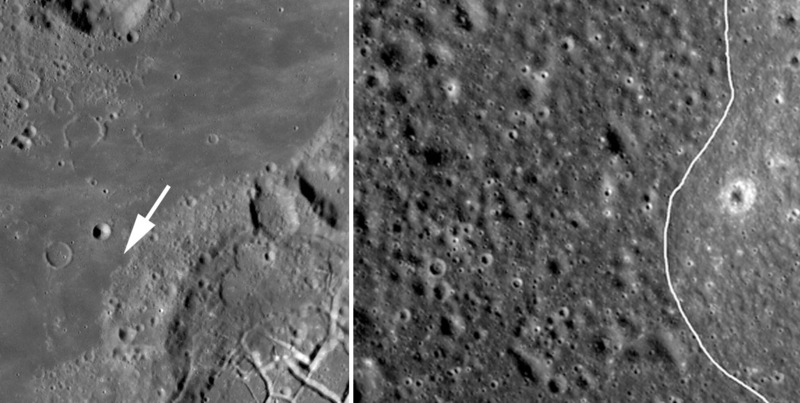 The LRO web site released this wide angle (left) and the narrow angle (right - about 1.8 km wide) camera views as samples of the data collection. The left view shows part of the rim and mare covered floor of the farside Moscoviense Basin RoI, and the right is a closeup of the mare/rim contact. The scientific rationale for this RoI is to sample a large farside mare and perhaps its inner basin ring via the rim of the floor-fractured crater Komarov. Notice anything unexpected about the closeup view, showing the younger basalt (left on right image) and the older rim (right)? The young mare has more impact craters than the older rim - how can that be? I suggest that the flat mare floor preserves craters formed there longer than does the inclined rim; although the rim slope looks small. Notice the gentle ridges on the rim paralleling the mare/rim contact. It looks like this is rim material that has moved downslope, presumably erasing craters as it went. Mark Tillotson reminds us that the Lunar Prospector went into orbit around the Moon on this date in 1998! This page was last modified on 25 April 2019, at 01:02. This page has been accessed 758 times.